The Rat Pack quilt block looked familiar to me and then I realized it seems like a less complicated version of a block called Birds in the Air. 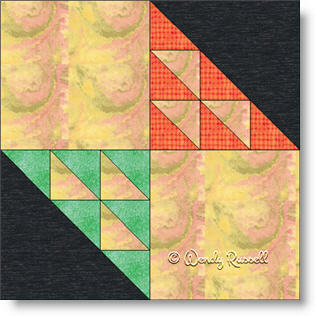 Both blocks are four patches, but the Rat Pack block would be a better choice if you are just learning how to make a quilt. It contains only squares and half square triangles, but you have to also play with the individual triangle pieces in places. An interesting challenge. Don't let a simple block fool you into thinking your quilt will be boring. As you can see from the sample quilts illustrated, by playing around with rotations of the blocks, I came up with some interesting quilts as a result (if I do say so myself)! See what your creativity can come up with using this interesting block.